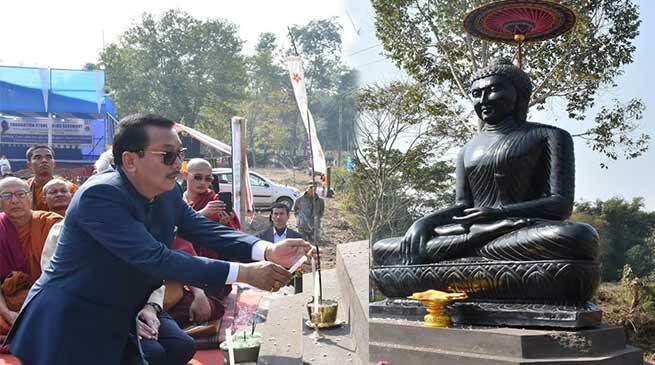 Deputy Chief Minister of Arunachal Pradesh, Chowna Mein attended the Foundation Stone laying ceremony of Royal Muong-Dum-Sun-Kham Buddhist Monastery at Charimuthia Konwar Gaon, Lakwa in Assam today. Speaking on the occasion, he said that the laying of the Buddhist Monastery would help to revive the lost culture of the people of the area. While citing the occasion as the meeting of brothers from South East Asian countries and the North Eastern region, he termed the Ahom communities as the elder brother of the Tai communities as they settled in the region 400 years before the Tai people. He lauded the Ahom Buddha Sangha for their social activities for the upliftment of age old culture, literature and spiritualism. He expressed hope that the area will be a Centre for spreading message of love, peace and affection. The Chief abbot of the Royal Thai Monastery, Phramaha Nipon Bhante, Buddhagaya laid the foundation stone of the Royal Muong-Dum-Sun-Kham Buddhist Monastery while Deputy Chief Minister, Chowna Mein planted a sapling of Tun-Pho (Banyan) tree bought from the Buddhagaya and Prof (Dr) Issara Suwanabol donated the Luong Pho Dham (Black Buddha statue) for the Monastery. Among others, guests from Thailand also attended the ceremony.